A lost history was found, a stone was returned and the church has a prominent position in a Stirling Museum. In Sept 2015 my son departed on his mission. He was feeling homesick at the beginning as his Grandmother was very ill and passed away a short time later. I thought I would research the story of David O McKay as a young missionary in Stirling and send it to him. My home ward is Alloa and we have a fibreglass version of the “What e’er thou art act well thy part” stone hanging in the foyer. Our ward boundary takes in Stirling where while serving on his mission and feeling homesick David O McKay noticed the carved inscription in stone on a building and read the motto that would impact him for the rest of his life. I looked online and found the article written for “The Journal of Mormon History” It was written by Matthew Richardson of BYU. He had extensively researched and interviewed all those involved in saving the stone in 1965 when the building it hung on was demolished. I was hooked and decided to find the location of Albany Crescent. I telephoned Stirling Council and spoke to the archaeologist who told me they did not know where the Crescent was located. So photo of Albany Cres in hand and with David O McKay’s description of events I headed for Stirling and walked the streets looking for matching church towers and landmarks. It took a few attempts but I felt I had found the location. A sister in my ward who lived nearby as a child confirmed I had pinpointed the right place. When I spoke to the Stirling Council archaeologist he informed me that the Smith Art Gallery and Museum were preparing a John Allan exhibition at the Museum for 2017. John Allan was the architect who designed Albany Cres and many other unusual and important buildings in Stirling. The museum was applying for funding to have a replica of the stone made for the exhibit. The funding did not cover the cost of producing a duplicate stone and the exhibition went ahead without one. In 2014 a replica had been made for the Edinburgh Mission Home (where the original had been displayed from 1965 to 1970) In Sept 2017 at Stake Conference I approached the Mission President and asked him about the process of having a duplicate stone made. Leading up to conference I had been prompted to look into the story again and felt it was important for the museum to still have a stone made and for a duplicate to be returned to Stirling. I was informed that another member of my ward had contacted him regarding the same thing. We joined forces and I worked with Matthew Richardson and Alan Johnson (Church History Museum) on the project. I trained in Venice, Italy as a stone restorer and did lots of research on the Albany Cres stone. It turned out that the original was carved from limestone and the stone would have been quarried in Portland, Devon. This was a long way to source stone in 1896 especially as there was a sandstone quarry near Albany Crescent. I found out there had been a second stone hanging on Albany Cres depicting a lion rampant weilding an axe. I had copies of photos taken by missionaries serving in Stirling that show the whole building. The stone seen by David O McKay was well known but the second stone had been lost in history. I took the fibreglass version from my ward to show the director of the Smith Art Gallery and Museum, Dr Elspeth King. We discussed having a replica made and I worked with her over a 10 month period on the project. She had approached Stephen Kerr MP, who is a member of the Alloa Ward and a newly elected MP for Stirling enquiring if the church could help with a duplicate stone. Stephen spoke to Elder Ballard and others and got permission for the church to fund the project. While on vacation to Salt Lake I visited with Alan Johnson and Matthew Richardson and started the process of making a new stone. I contacted several companies who could make the new stone and settled with a local stonemasons, James Innes and Son’s. They were 6th generation stonemasons and their ancestor may have carved the original stone. Having discovered there was two stones on the building Stephen Kerr MP went back to church leaders and got permission for both stones to be funded. Adam Innes worked on the project and did a wonderful job of carving the stones from limestone. Meanwhile I researched John Allan and David O McKay. I looked back in history to try and work out what the meaning of the stones were. Albany Cres was located directly below Mote Hill. Mote Hill is where a medieval beheading stone is located. In 1887 John Allan designed a cage to protect the beheading stone. King James Ist had his cousin the Duke of Albany beheaded on the stone in 1425. James had been a prisoner of the English courts for 18 years and the Duke of Albany had been regent of Scotland in his absence. The lion on the second stone was wielding an axe, could this represent King James Ist? 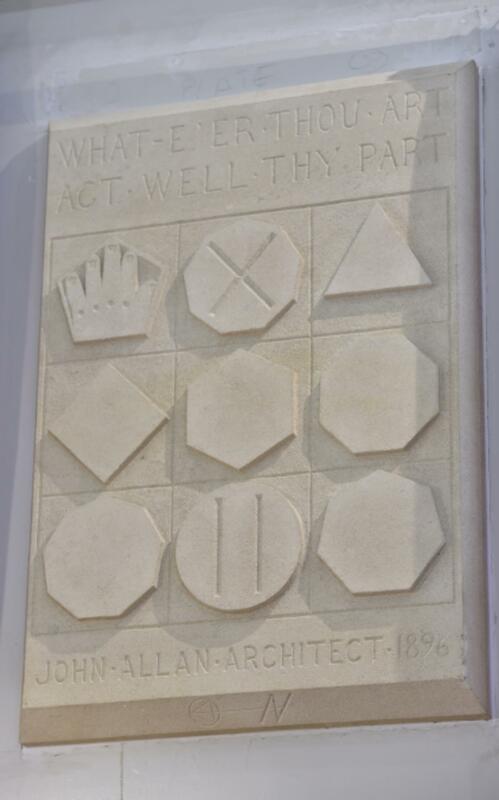 On the “What e’er thou art act well thy part” stone is a magic square. It has 3 rows and 3 columns. If you add the numbers up in any direction they will add up to the same total. Historically the total is 15 using the numbers 1-9. On Albany Cres the total adds up to 18 using the numbers 2-10. King James spoke often of his 18 years as a prisoner. Could this confirm the carved stones were written about medieval Stirling? There is also a quote from the Canterbury tales below the lion rampant stone that adds to the story of King James Ist. I took my research to Elspeth and she agreed with my findings. Had a lost part of Stirling’s history been found? It was decided that the two stones would be hung high on the wall of the museum similar to their position on Albany Cres. 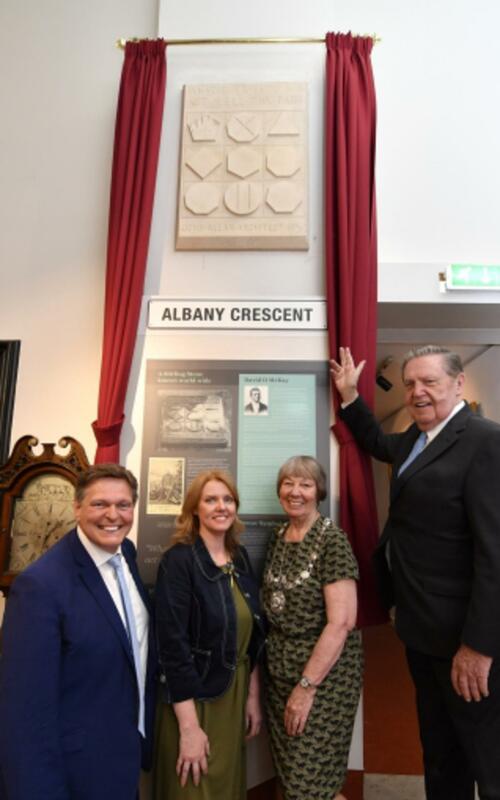 Below would be the text panels telling the story of David O McKay, John Allan and Albany Cres. Elspeth asked me to write the text for the panels which was a great challenge as I am dyslexic. I worked for several weeks late into the night and Elspeth helped to cut my word count down. I read books and articles on President Mckay and my love and appreciation for him grew. The two stones sit in the entrance hall of the museum. One on the left and one on the right. Albany Cres had a lane down the centre of the building and the stones were hung either side of the lane. We tried to recreate the same look they had on the building. My next job was to design and make curtains for the unveiling. The text panels were angled at the bottom as there was handrail on the wall above 4 steps. The curtains needed to be cut on an angle to fit the space. I needed 12 metres of fabric and searched for affordable fabric as I thought it would only be in use for one day. I planned on red velvet but it it was too expensive. Several shops later I came across some burgundy fabric that was well priced and decided to go with it. After sewing the curtains I visited the museum to hang the curtain poles and the curtains. The fabric I chose was a match to the Museum colour and they have all the doors and headed paper the same colour. It could not have been a better match. Elspeth asked it they could stay up after the unveiling. I rushed home and sewed 4 tie backs to complete the exhibit. I currently work full time renovating an old Victorian property that is my home. I have learned a lot of skills working on the house. While fitting the curtains the staff were stripping packaging tape that was holding the vinyl floor tiles in place, the plan was to replace it with fresh tape. I told them about a product I use that would help repair the loose tiles. Next day I was back and spent the morning filling the gaps in the floor and a few days after the exhibit opening I was able to return and repair another section of flooring. For the opening Elspeth asked me to do a presentation on David O McKay and my research. The speakers at the opening were Elder Jeffrey R Holland, Provost Christine Simpson, Stephen Kerr MP and myself. Later when I got home I received a beautiful email from Elspeth thanking me for all my hard work. Her words really touched me. Elspeth retires at the end of August and I wanted the exhibit to be perfect for her. I was representing the church and the Lord so tried to do my best to make it all come together. The motto ““What e’er thou art act well thy part” spurred me onto do my part well. With the help of many other people, each representing a number on the magic square we all worked together to make the magic happen. I have been back several times to the museum and Elspeth has asked me to help with sewing for another exhibit. I have made new friends and hope that the story of David O McKay will touch many more people as they visit the museum.